Today’s garment is a bit later than the others I’ve posted on my site, but be warned- my collection goes into the 1940s, so… more later stuff is coming. I need to disclose- I am 95% sure this dress belongs to a friend without proper collections storage, and I am storing it for her until? But, it’s been in my boxes for a while, so it’s getting photographed with the rest! I am also going to point out the pictures aren’t the best. I had about a week of overcast days, and got impatient, and well… it shows. I will perhaps go back and photograph this garment again another day, but for now, moving on. I got pretty good construction images, and that’s what I find most interesting about the dress. 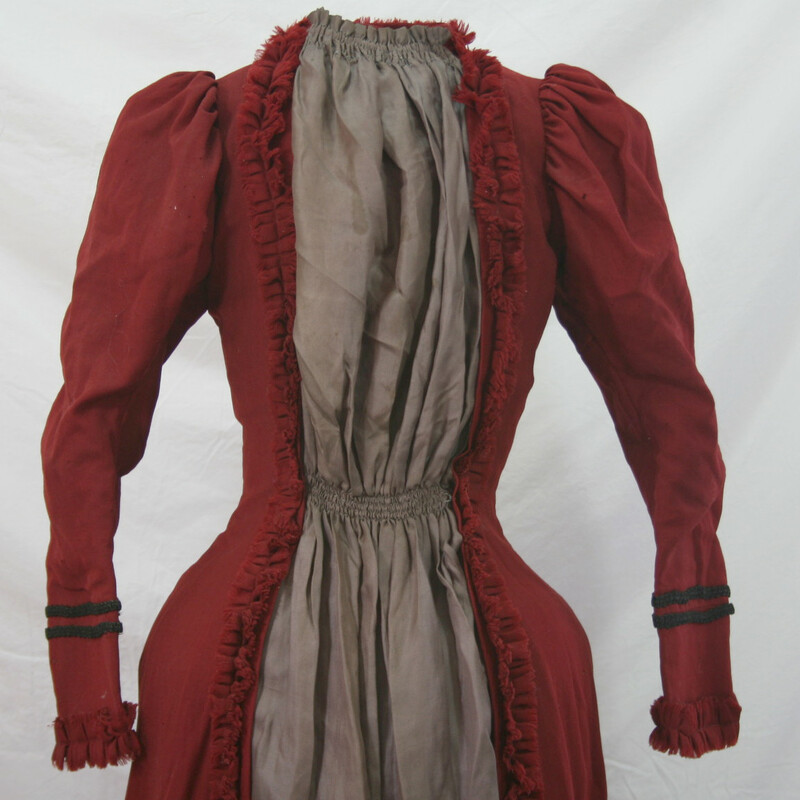 This bustle dress is made of red wool and grey silk twill. It is fully lined in brown cotton, and trimmed with black velvet soutache and self-fabric strips. The hem facing is bias-cut cotton velvet. 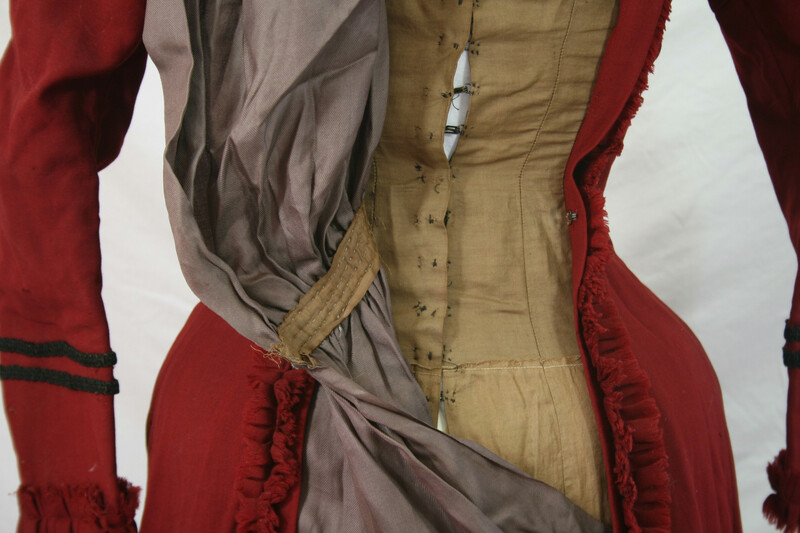 The silk front panel is shirred in the front, and the waist is 25″. The grey silk front panel closes at neck and waist with a hook and eye. Underneath, the lining closes with hooks and eyes. Note the adorable scrap-fabric pocket on the lining! 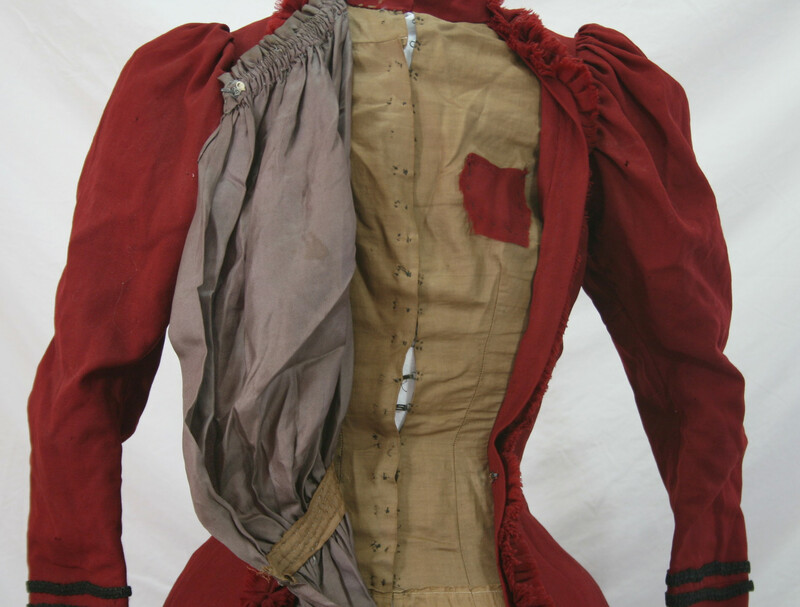 The hooks and eyes go down to about the upper-mid thigh point, at which point the lining is stitched together to the bottom of the garment. 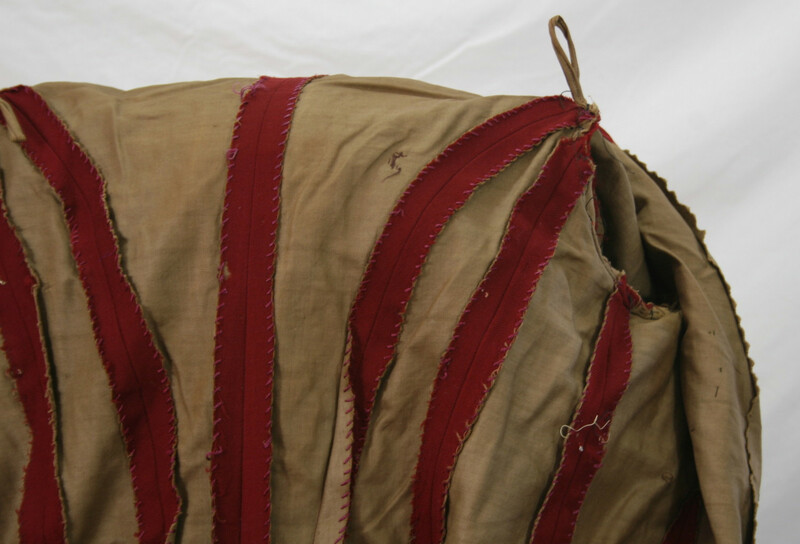 The silk is also stitched to the wool on both sides from this point down. The seams are hand overcast, and there are loops on either shoulder, likely for hanging. The self-fabric trim is bias-cut, fringed, pleated, and stitched on machine. It is then hand-basted onto the garment. 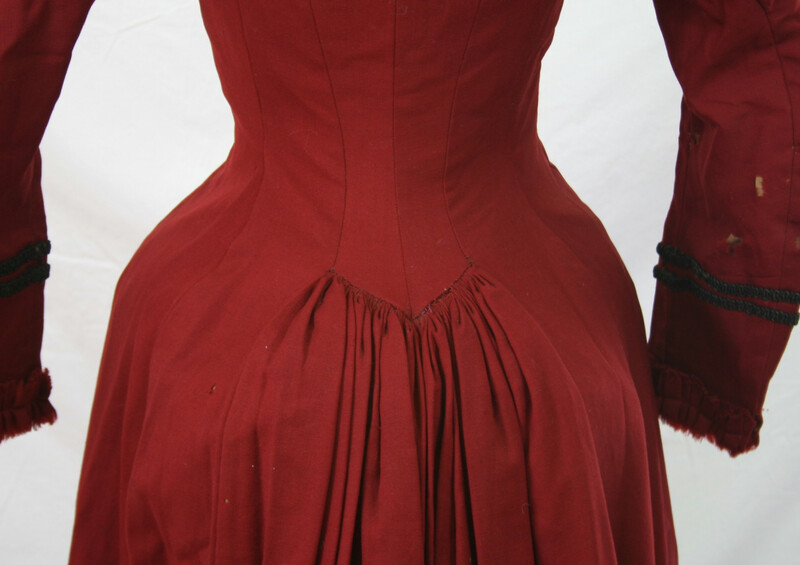 The back of the down features a slight bustle. 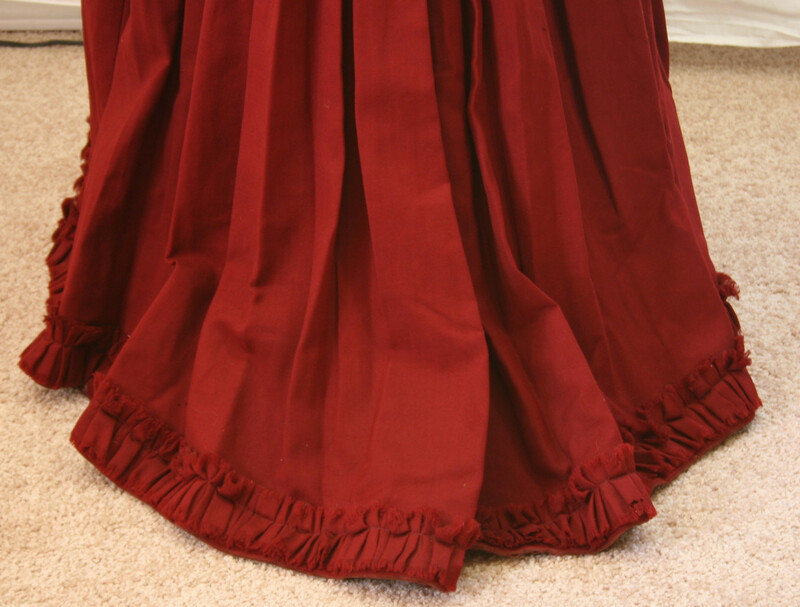 The fullness of the skirt is controlled at the center back with cartridge pleats.